Our tour begins at the bottom of Bath Street and proceeds along its east side towards the Market Place exploring, in sequence, streets off our left such as Station Road, Chapel Street, Burr Lane, East Street and Albion Place. After a rest in the Market Place and a stroll into Pimlico we set off along the west side of South Street, walking towards Derby Road, with a detour into Queen Street and its environs. At the southern end of South Street we will then explore Derby Road, the Stanton Road area, Nottingham Road, Market Street and then the White Lion area before resuming along the east side of South Street, with a walk up Weaver Row, before returning into the Market Place. A stroll down the west side of Bath Street, taking in Mount Street and Club Row, will return us to our departure point where we will finally contemplate a few areas beyond Bath Street. For those of you not familiar with the streets of Ilkeston, the above remarks must be very confusing. 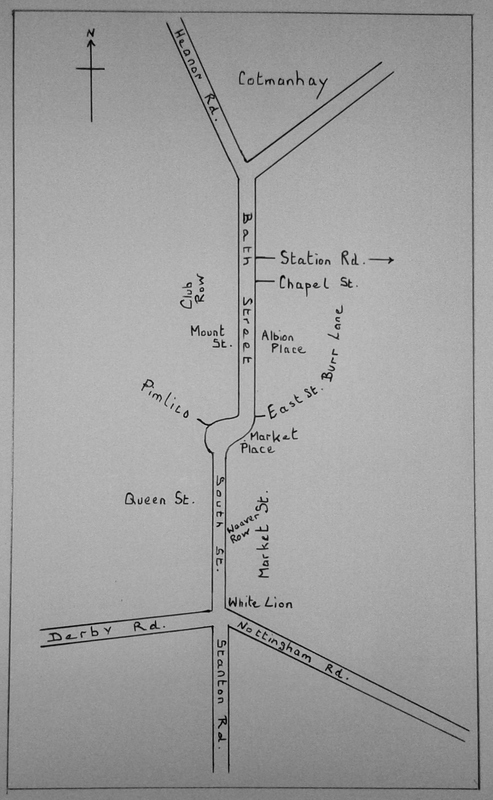 This sketch map — not drawn to scale — hopefully shows the relative positions of these streets. Just a few style points before we set off. Prices etc. are represented in pre-decimal (old) money, without any attempt to convert into ‘new’ money. 1s is one shilling and is equal to 5p while 1d is one old penny, worth just under ½p. Some sources are shown in red. These are cited and explained in the ‘list of sources’ found at the end of this section. Adeline Wells was born Elizabeth Adeline Columbine in East Street, Ilkeston, on Monday, October 2nd 1854 and lived in the town until she moved to Nottingham with her family about 1879. Towards the end of the century, with her husband and son, she moved to live in Eastbourne, Sussex, where she spent the rest of her life. In the year following her birth the Ilkeston News speculated on the ‘probable future’ of Ilkeston. “The welfare of the masses is the object of every true philanthropist, and Ilkeston is a town where much leading beneficial influence is needed. At present it is in an embryo condition; the chrysalis has not fully emerged from its shell; yet there is a gradual development, which is more surely making known the physical, mental and moral resources of this important district. And in proportion as education, civilisation, and refinement keep pace with the more external improvements, the rude and harsh features of a newly-forming town just struggling into a marked existence will pass away – as the grey mists of the morning, with their chilling dews, before the rejoicing beams of the gently conquering sun”. As we walk around the town we may see if the newspaper’s prophecy was to materialise.